A different take on the traditional Caesar salad. Mix Smashed Egg, crispy chopped bacon, Parmesan and Caesar dressing. Pile mixture into mini Cos lettuce leaves, top with more Parmesan. 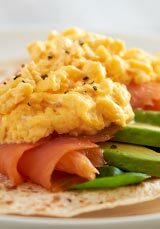 Easily built on any firm bread slabs, mix some canned asparagus and Smashed Egg bound with a little mayo or cream cheese. Add anchovies for a hint of salt and sprinkle with oregano before grilling to heat. Shave Parmesan on top for a finishing touch. A light and simple snack that’s sure to please. Serve with a delicious relish to enhance your diners eating experience. A menu idea that’s so easy and simple. Plain Omelette, with Ham & Cheese on a Toasted Wrap. Served with ham and cheese, this Plain Omelette wrap is perfect for any menu and any time of day. Ham & Cheese Egg Bake with Tomato & Mushroom Salad. Our Ham & Cheese Egg Bake can be served with almost anything! Why not try it with roasted tomatoes and sautéed mushrooms. A light and simple snack suitable for any menu. Freshly baked croissant filled with our fluffy Scrambled Egg Mix – a perfect match. Spoil your diners with this deliciously easy to make snack at any time of the day. Give it that extra touch by adding a slice of smoked ham, avocado or prosciutto. Scrambled Egg Mix Wrap with BBQ Sauce. 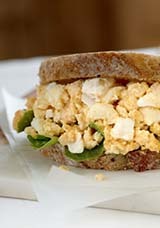 Made with fresh farm eggs, the Scrambled Egg Mix is perfect in a wrap with BBQ sauce. Get creative and create your own meal. This is a simple & versatile meal for your menu. You can use any one of our Omelettes. Just pick your favourite, place it in a freshly baked roll and add your choice of sauce or chutney. This Cheese & Chive Omelette is delicately served on a bed of spinach leaves. A classic combination of flavours that is sure to impress any diners looking for the taste but not the calories on your menu. Try adding even more flavours such as crumbled fetta and capers. Our Cheese & Bacon Omlette Patty is a delicious snack. Serve with crispy lashings of bacon on a fresh crusty bun. We love it with BBQ sauce! We crack em’ so you can stack em’! Spanish Omelette with Garden Salad. This is another great menu option for your health conscious diners. Try different salads to compliment our Spanish Omelette, such as a Greek salad, Caesar salad or nicoise salad. This simple snack is packed full of goodness! Plain Omelette with Asian Greens. 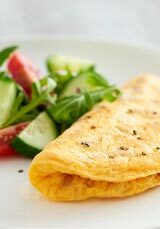 Pair our Plain Omelette with fluffy steamed rice, crunchy Asian greens and a tasty soy sauce dressing. Salmon, Spinach & Poached Egg Muffin. Smoked salmon, sautéed spinach, creamy Poached Egg and a dollop of hollandaise sauce all stacked in a toasted English muffin. This is a perfect menu option for diners that are looking for a filling snack on the go. Packed with protein and flavour.